Peter Parker (Tobey Maguire) has finally managed to strike a balance between his devotion to M.J. (Kirsten Dunst) and his duties as a superhero. But there is a storm brewing on the horizon. When his suit suddenly changes, turning jet-black and enhancing his powers, it transforms Peter as well, bringing out the dark, vengeful side of his personality that he is struggling to control. Under the influence of the suit, Peter becomes overconfident and starts to neglect the people who care about him most. 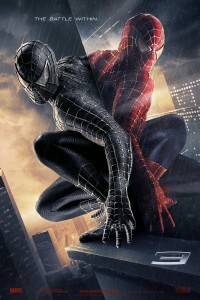 Forced to choose between the seductive power of the new suit and the compassionate hero he used to be, Peter must overcome his personal demons as two of the most-feared villains yet, Sandman (Thomas Haden Church) and Venom (Topher Grace), gather unparalleled power and a thirst for retribution to threaten Peter and everyone he loves.